What is Wrong in These Pictures? Home » What is Wrong in These Pictures? We apologize that the chemical formula on the bottle to the left is difficult to read. We can tell you that it starts with NiOH, which is Nickel Hydroxide. We think; we are not sure. The question mark on the label is disconcerting. This next collage of images is from the New Jersey Department of Environmental Proteciton (NJDEP) website. We are going to help you out witih some descriptions here, because the photos are small and it might be difficult to see what is going on. The picture in the upper left is a bottle with an indiscernible lable that appears to be leaking. The lower right picture shows waste, not properly labeled, also leaking. If you would like to see what the NJDEP has to say about this picture, follow this link. SCM advocates that the best controls for chemical hazards are ELIMINATION of the hazard, and if that is not possible, SUBSTITUTION of a lesser hazard when possible. 1. Eliminate unused chemicals more than 7 years old. 2. Substitute lesser hazardous chemicals when possible. 3. 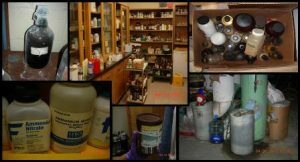 Store chemicals by compatibility (check the SDS if unsure). 4. 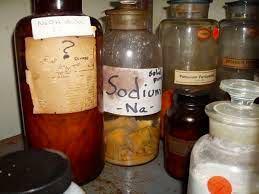 Label all chemicals in storage and in use. 5. Post emergency contact numbers and the Emergency Action Plan where employees can see them.